This pen is a water-proof containing permanent ink which has etch resist properties. 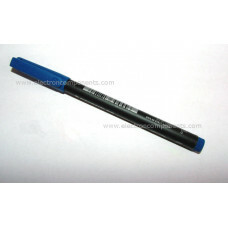 A nylon tipped pen for fast fabrication of perfect printed circuit boards. Circuits can be drawn on plain copper laminate and then etched in Ferric Chloride or etchant solutions. Allow it to dry for 5-10mins then immerse the board in etching fluid until the copper is dissolved. After etching the ink can be removed with cleaning fluid or PCB cleaner and the circuit board is then ready to be drilled and assembled. Copper Clad Phenol Board - PCB Board - 6x4"
Glass Epoxy Copper Clad Board - PCB Board - 6x4"
Copper Clad Phenol Board - PCB Board - 8x4"
Copper Clad Phenol Board - PCB Board - 8x6"
Copper Clad Phenol Board - PCB Board - 6x6"
Copper Clad Phenol Board - PCB Board - 4x4"